Mads Mikkelsen plays the villain, Le Chiffre, in Casino Royale. Number 21in the Bond film series, Casino Royale gets to the roots of the British SecretService agent, before he's attained his double-0 status. He's still charmingand he's still deadly, but this new James Bond played by Daniel Craig is alsohuman. "The actionscenes are very Bond but hopefully a little more realistic than previous Bondfilms," director Martin Campbell told SPACE.com at a press gathering in New York. It's JamesBond in the raw. He falls in love and gets his hands dirty, making for bothsweaty and bloody action scenes, which as intended, are more realistic than thegadget-heavy stunts of past films. "In GoldenEye it was pretty conventional in terms of a Bond film. The character was verymuch the Bond we've all been brought up with. In this one, he goes to a muchdarker kind of process, quite honestly, he gets poisoned, he gets the hellbeaten out of him in the torture scene. The violence is much less [computer-generated],it's much grittier and tougher--he bleeds a lot. He's much more vulnerable, hefalls in love, genuinely falls in love," said Campbell. The film sticksclose to Ian Fleming's 1953 novel of the same name, so you won't see the madgadget-inventor Q. "We kept away from gadgets. It just doesn't sort of fit thetone of the movie," Campbell said. The superspy's first mission involves jet-hopping to locations such as the Bahamas, Uganda, Italy and Madagascar, in a quest to take down the banker to the world's terroristorganizations, the villain Le Chiffre. Along the way, he doesn't miss out onthe cliche one-night-stand with sensual Solange played by Caterina Murino [image],girlfriend of one of the bad guys. Bond isself-sufficient as always, but he is joined in the new movie by a stellar castof characters who have depth and allure of their own. The outcome is anengaging story that pulls at your heartstrings and intellect. Forexample, when Bond girl Vesper Lynd, played by Eva Green [image],plops down in a train-car table across from Bond, she says "I'm the money. "Bond replies, "worth every penny." The line harks to past films, but with a newtwist: Vesper isn't blushing pink at the mere sight of Bond, and she doesn'tsport a bikini. Instead,Vesper charms the pants off Bond, who reveals he's not immune to falling inlove. The villain,played by Danish star Mads Mikkelsen [image],shows that the bad guy is just as complex as our hero and perhaps more so.Trumping the Goldfingers and Dr. Nos, motivated by their hunger for worlddomination, Le Chiffre is in it for the money. Rather than being on top of theworld, Le Chiffre is fragile, a fact underscored by a visible scar above his eye.And he weeps blood, adding, Mikkelsen said, "something fragile, I guess,something weird," to his character. The eyealso makes it tricky for Bond to read Le Chiffre in a palm-sweating poker game. 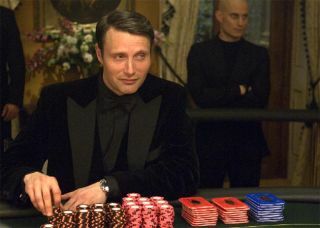 SecretService intelligence reveals that Le Chiffre is planning to raise money in ahigh-stakes poker game at Le Casino Royale. 'M' assigns 007 to play againsthim, knowing that if Le Chiffre loses, it will destroy his organization. In a gamewhere the stakes are not measured in dollars but rather human lives, every handcould be their last. "It's not about the game. It's about losing your life.There's a lot of things at stake in this game, and so we wanted to focus ondrama as well in this game," Mikkelsen said. "It was afight. We never have a physical fight in the movie. That was our physicalfight," Craig said. When thecurtain falls, Casino Royale works as a Bond film. Fans will get theirmillion-dollar car chases, including the new Aston Martin DBS that sets a newrecord with eight cannon rolls. And there are still the witty, and perhapscheesy, one liners, with a stylized Bond walking away from the fires and bloodyfights with a suave strut--a natural for Craig. "I want itto be as stylish as it possibly can. That's all I ever wanted to maintain,"Craig said.